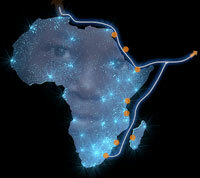 People all over East and Southern Africa have been awaiting faster internet speeds for a LONG time. I, for one, won’t miss hearing the infamous, “when the cable comes…“ quote that plagues so many of our conversations. It’s here. Now. SEACOM has done a good with PR and reaching out to people via their blog and Twitter accounts. SEACOM’s media team was also uploading video in real-time to their YouTube channel, so click there if you want to hear really bad audio of the speeches… 🙂 They have their new press release out here, if you’re looking for the “official” talk. Steve Song has put together a great interactive map that helps you visualize what undersea internet cables go where in Africa. There’s also a helpful table of statistics and data on each of the cables. Head on over to his site and check it out. More on the history of this project. Russell Southwood’s Balancing-Act newsletter is one of the best sources for internet and mobile statistics and reports in Africa. If you don’t read it, you should. If you run any type of mobile, web, or ISP-type company in Africa and you can afford it, then you should be buying the reports. Here are some excerpts from the recent one on Broadband Markets in Africa with some opinions thrown in by me. No matter where you go in Africa there is no easy way to find out what types of broadband connections are available. There would be nothing more useful than a wiki-like tool that people could add to and compare against. A place where people who use these tools can put up their experiences and let others know about the “true” bandwidth provided by companies. This is especially true for residential customers. 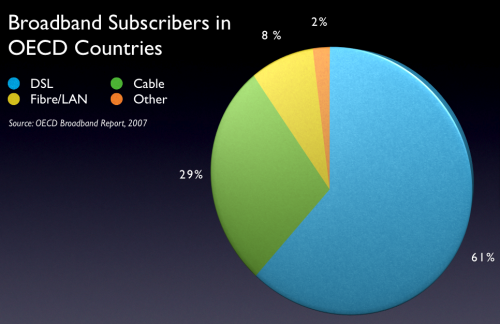 In the worldâ€™s most developed OECD countries, 61% of subscribers got their broadband through DSL services by 2007, 29% through Cable TV (CATV), and 8% through Fibre LAN connections. Just 2% of subscribers â€“ some 3.455 million â€“ subscribed to broadband through â€˜otherâ€™ fixed wireless broadband services. In Africa, some 59% of broadband subscribers use DSL, just 1% use CATV, and the remaining 40% use wireless broadband. 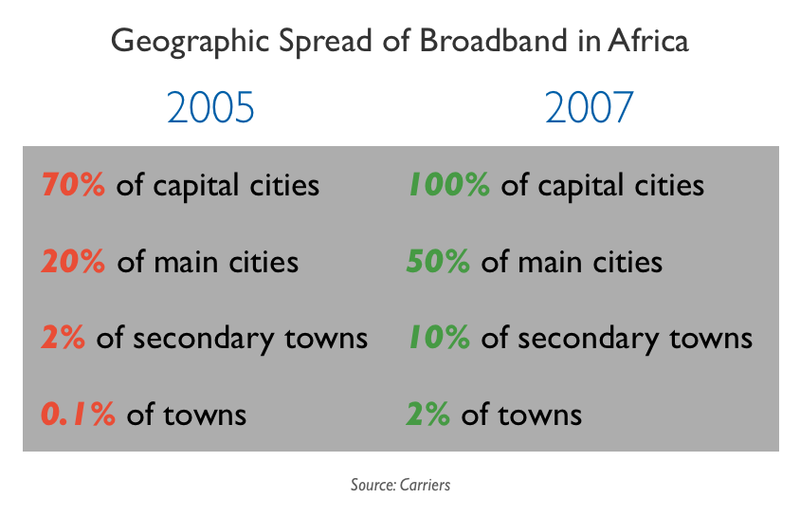 By December 2007 terrestrial broadband networks were now available in every capital city in Africa, some 50% of main cities, 10% of secondary cities and 2% of towns. As elsewhere, the Internet in Africa has a symbiotic relationship with other media, particularly television. After a controversial scene in the second series of Big Brother, there were five million downloads of that scene. Ninety per cent of those downloads came from within Africa and of those 33% were from South Africa and 37% from Nigeria and Uganda. Similar response rates on SMS voting and competitions shows that this will be fertile ground for broadband content development as the subscriber numbers increases. On a continent that has a wide variation in the amount of internet access available when moving from urban to rural settings, the hand tips to those that have lower costs in rolling out infrastructure. Land lines, cable and fibre all cost a great deal to deploy. Mobile phone carriers have the ability to do so at a lower cost through towers. It’s a node vs line problem. The key battle ground in the next five years will be between 3G services (or higher) offered by GSM and CDMA operators and fixed wireless broadband services. The outcome of this battle will shape the broadband experience in Africa, whether customers use mobiles as Internet access devices. …Mobile operators launching 3G networks are offering access speeds which compete with the broadband wireless services. When that access is just as fast as land lines, then there’s no reason at all to stick with an internet solution that forces you to stay in one place. 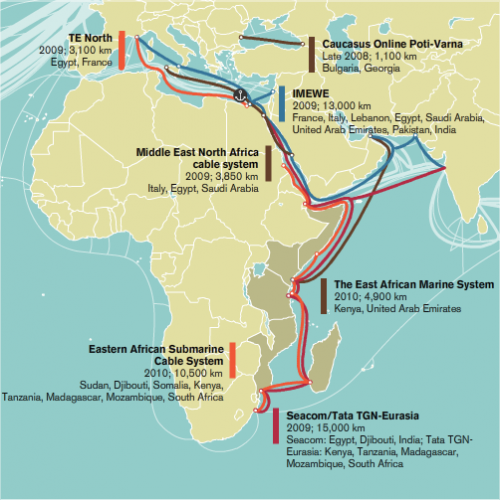 The most recent technology review has a good article on the transoceanic internet cable build-out happening world wide. It’s got a nice little map visual too, which allows you to see where things are (white lines) and where new undersea cables are being installed. East Africa is one of the last major regions in the world to not have true international broadband (aka: “fat pipes”). Having just returned from a 3-week stint in Nairobi, I can tell you that these cables will make a huge impact on the local market. Uploading video, watching video, uploading images, sending emails with images, receiving images, downloading applications, uploading zip files, FTP, VoIP calls… and more. All that stuff is painfully slow or impractical to do right now. You don’t realize how much you use these types of service in the rest of the world, until you’re forced to do without for an extended period of time. 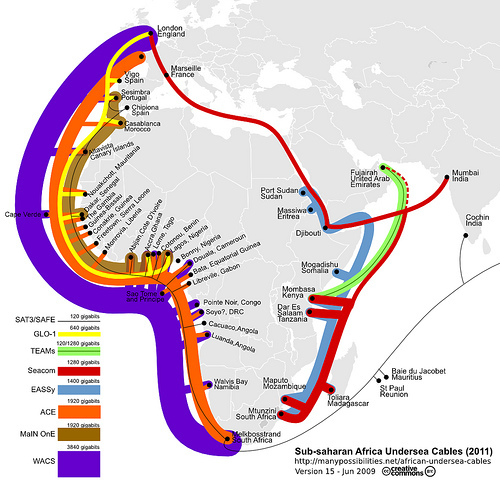 I, for one, will continue to pray to the undersea cable gods that East Africa will see this cable by this time next year.